If your internet at home isn't available in enough of your home, the TP-Link Powerline might be your solution. Based on their website, you'll have many different options depending on your needs. You can either add wired connection or increase your wireless connection, as long as you have a power in your house. In many older homes (and newer homes), most rooms are not setup with a wired Ethernet. And the unfortunate fact is that adding in a wired Ethernet port to an existing wall is an overly expensive solution. Or if you are renting and you cannot tear open the wall. 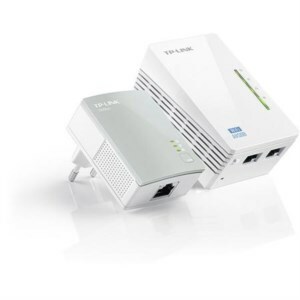 The TP-Link Powerline adapter to with an Ethernet port and transmits data via the existing power lines in your house. This allows you to add a new wireless hotspot to your existing wireless connection. The upside here is that the connection is the same SSID, which means it is merely bridging your existing connection. The TP-Link Powerline adapter (one that you choose) comes with a wireless transmitter. My needs for this is simple. My house is older and the home is not wired with Ethernet cables. My wireless N router is located right in the center of the house, but on the second floor. I've noticed that the wireless signal is weaker the further I get from the center of the home. Now I've mounted the TV and all the entertainment related systems (like the media center and Sony PS3) at the edge of the house where it is most logical. The signal here was not strong enough, so streaming YouTube was weak, and playing PS3 games online were laggy. I needed a solution, and the TP-Link Powerline AV500 was my solution, and has worked great (so far trouble-free for 3 months). There are many different types of Powerline devices with different specifications. I decided to go with the TP-Link Powerline 300 Mbps Wi-Fi Range Extender (that comes with 2 Ethernet ports). This is perfect for my needs. The 2 Ethernet ports linked to the media center and PS3) while the wireless will be good for cell phones, iPads, and the TV. Other Powerline devices may not have the wireless transmitter portion, and only the Ethernet portion. How does the TP-Link Powerline work? It works by using your homes power lines as a cable for transmitting the data. You need at least two adapters. One at the side of the router, and at least one more of the extended areas. The speed you can get depend on the wiring in your house and the amount of wire (the distance). Setup is straightforward. All that is required is a simple pairing process that needs to happen between your device and your router. It did take me a few trys to get it to work, and the blinking lights on the TP-Link adapters weren't user friendly form of communicating success. And since mine was wireless, it was difficult to confirm the wireless was working unless the adapters was far apart. Therefore, having a second person help during setup, was a big help. All in all, all I had to do was press a button on the router, then press a button on the adapter to synchronize the SSID. Then, press a button the the first TP-Link Powerline adapter to the second TP-Link Powerline adapter to synchronize the two Powerline devices. In general, for my case, the TP-Link Powerline AV500 system has been working great for several months, without requiring me to restart or unplug any portion of the system. On the downside, setup was a bit of pain. A combination of poorly written instructions and confusing adapter lights did make the setup of synchronizing the SSID process extremely painful. Luckily, the installation process only needed to occur once. I have recommended the TP-Link to several other people as a way to increase the internet reach within their house.